Bullet Bouquets. No better way to call them than that. 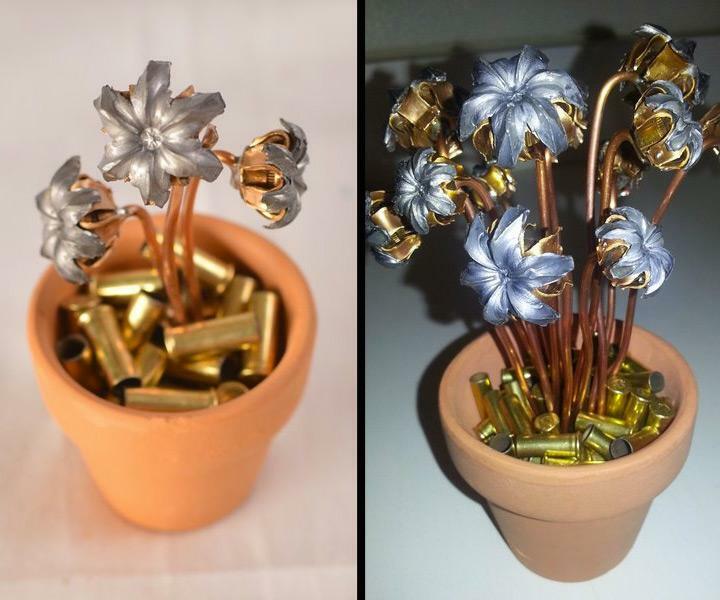 And just as cool as these loaded pots of blooms: gung-ho shooter and artist Anthony Zambai saw the idea for them on Reddit less than a week ago. 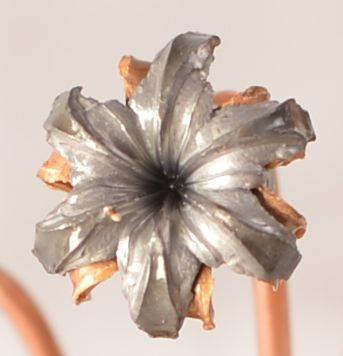 When the Bullet Bouquet was presented on the front page of the Internet, a ton of people responded with comments along the lines of...Dude. I want that. So this clever dude and his wife, Amber, set themselves the goal of crafting an entire business over the weekend. They researched, created prototypes, bought a domain, built a website, set up a Facebook page, and opened the online store, Bullet Bouquets, in exactly 3 days. No better way to be American entrepreneurs than that. 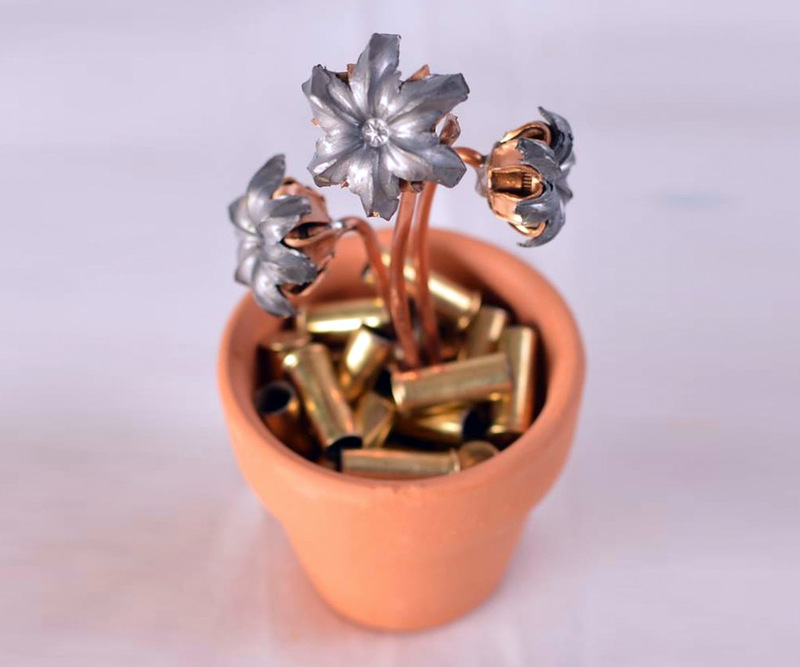 Now you can get your own Bullet Bouquet, made of authentic, spent hollow point bullets. 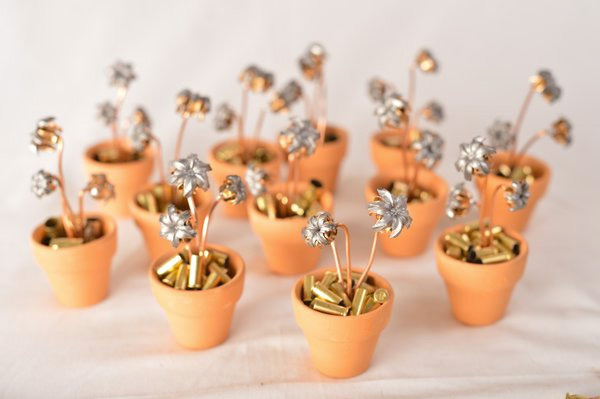 Sold as tiny pots of 3 to 12 "buds" each bouquet contains copper jacketed lead bullets that have been expanded, deformed, and turned inside out post-firing. Each bullet has been clear coated for "mostly" safe handling, though Zambai does recommend washing your hands after handling the bouquets, as well as keeping them away from children and pets. Awww, how romantic.